I recently wrote an article designed to get Council moving on creating a Lexington Place TIF. The reason was to prevent the city from losing $3 million in funding for road improvements. That article generated a number of comments about the traffic on Old Troy Pike. These commenters are correct. There are many more delays in the area between Taylorsville Road and Park Town than there are on the West sides of Chambersburg and Fishburg Roads. This article will address that traffic and the funding for improvements to this area. Here are things to keep in mind about funding the needed improvements for Old Troy Pike. First the TIF District to fund these improvements was created in 2005. This TIF district stretches from the Walmart on Brandt Pike all the way down Executive Blvd then past Gander Mountain. It is the Blue area in the picture below. This TIF has been especially fruitful in bringing money into the City. It was originally created to pay for the I-70 Interchange improvements on Old Troy Pike and Brandt Pike. By 2009 it had already collected enough money to pay off loans for these improvements. Not only that but it had $3 million dollars in reserve. Today all the money from this TIF is set to be used to pay off the loans for the Music and Aquatic Centers so there is none left over to pay to reduce traffic congestion on Old Troy Pike. In fact, even though in 2009 there was enough money to pay off the I-70 improvements, the city didn’t. Instead they are using gas tax revenues to pay these debts. All is not lost though. The nice part about having such a large undeveloped area in this TIF district is that each new development generates more TIF dollars. Eventually this TIF will generate funds that could be used to reduce traffic congestion. That may happen within the next couple years. 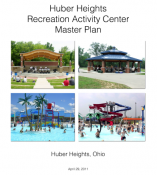 Currently, more development is needed to pay off the existing Music and Aquatic Center debt. When council was briefed a few years ago the city still needed $60 million more dollars of development in order to cover the construction costs of the Music Center. Since then, the renovations at Children’s Hospital has reduce that $60 million figure. As has the I-HOP and the new Tru Hotel by Hilton, just to name a few. After we get enough coming in to pay the existing debt, the tricky part will be to convince council to plan for and then commit to using the TIF money for road improvements that can reduce congestion. One way council can show you that they are dedicated to this goal is for them to insist on getting a professional five year capital improvement plan. You can view the Five Year Capital Improvement Plan Council approved July 9, 2018 and see they do not have very high quality standards. This document tells us they do not even intend to start planning for improvements to the west sides of Chambersburg/Fishburg roads or to relieve congestion on Old Troy Pike. Your best course of action for a permanent solution to congestion on Old Troy pike is to make sure your council does the planning necessary. You can verify this by looking for the details in a professional quality Five Year Capital Improvement Plan. You also need to make sure council uses additional TIF revenues for these road improvements. If roads are important to you look for instances when council wants to use this funding source for other projects. 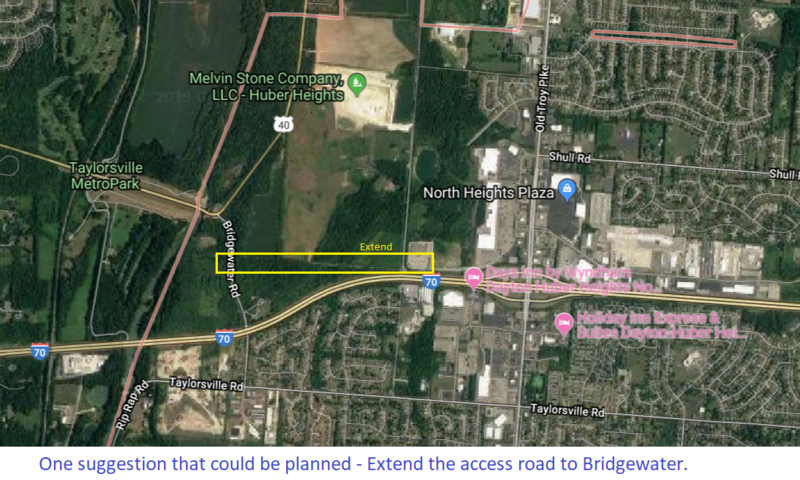 If congestion on Old Troy Pike is one of your concerns, you should be aware that council is discussing implementing the recommendations from the Brandt Pike Revitalization Study. As the video to the left shows, implementing these recommendations is expected to move traffic off of Brandt Pike and onto Old Troy Pike. Before I get to that, I have to advocate for using the $3 million dollars generated from the Lexington Place TIF for this section of Chambersburg. This is because this road services area where the money comes from more directly. Additionally, although traffic is not as bad there now, with the addition of almost 200 new homes it is most certainly going to get worse. 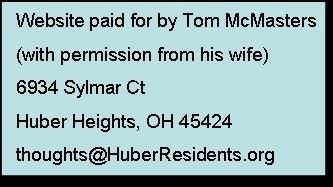 Also, from an economical stand point, it will be better for Huber businesses, especially those that would locate in the almost vacant Imperial Plaza, if residents could efficiently be integrated into Old Troy pike instead of going out the back way through Dayton. But first things first, Council has to create the Lexington Place TIF now, in order to avoid losing that funding! Maintaining good roads is a key government function. Projects often take 10 years to implement once officials identify they need done. There is nothing in the City's Five Year Capital Improvement Plan that tells us council plans to will Old Troy Pike any time soon.